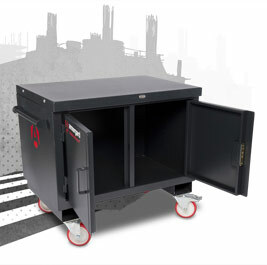 Use the Armorgard Mobile TuffBench™ for a day and you’ll wonder how you ever got by without it. A combination of heavy-duty storage cabinet and multi-purpose work surface, this innovative workbench makes any job that bit easier, while ensuring that your tools and equipment remain safe from thieves and damage. Its ultra-tough surface is ideal for fixing chain vice, engineers vice and other equipment, making it indispensable for M&E contractors when pipe threading and bending. Armorgard will be exhibiting at the Executive Hire Show At the Executive Hire Show at the Ricoh Arena on 11th and 12th February; the exhibition where Passionate Hirers meet Innovative.